Cliff Mass Weather and Climate Blog: Why is the Northwest Warm and California Dry? Part 1. Why is the Northwest Warm and California Dry? Part 1. Why is it so warm this winter? Why so little snowfall in the mountains? Is the warmth and snow drought connected with human-caused global warming? Is there a connection with the cold and snow over the eastern U.S. and our anomalous weather? Or with the drought in California? What is the role of blob (the region of warm water off our coast the last year)? 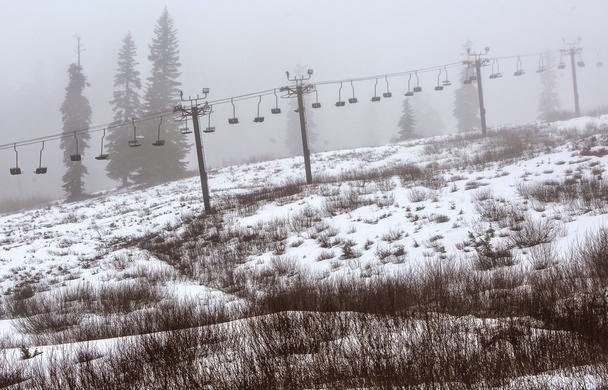 Today the Seattle Times front page headline called out the poor Cascade snowpack and showed a picture of the Snoqualmie Summit ski area that would bring depression to any ski enthusiast. And media all over the country are asking similar questions. Fortunately, there are some solid answers to these questions. Combining some basic meteorology, logic, and the results from a number of new research studies, this and my next blog will attempt to provide a coherent picture of what we know. Yes, they are all interconnected. Natural variability is the probable cause. There is no reason to expect that anthropogenic (human-caused) global warming has much to do with it. So what is going on this winter? It is quite easy to explain the proximate cause of the warmth over the Northwest, the drought over California, and the cold/snow over the eastern U.S. They are all caused by the same basic phenomenon: a high amplitude upper level pattern with a persistent ridge over the West Coast and a trough over the eastern U.S.
You can see this in a map of the difference from normal (the anomaly) for the last 90 days for 500 hPa heights (think of is like pressure at around 18,000 ft). Above-normal heights (ridging or high pressure) are indicated by red colors and below normal heights (troughing) by blue colors. You can see how disturbed the atmosphere is over and near North America. Want to see what this pattern looks like on a specific day?...here is the forecast for this Thursday, a day that will probably hit 60F in Seattle and bring another snowstorm to the Northeast! Big ridge over the western U.S. and trough in the east. I am tired of this pattern. In general, ridges bring dry conditions and warmth, while troughs are associated with cooler, wetter situations. Here is the surface air temperature anomaly (again difference from normal) for the last 90 days across the U.S>. Warm in the west under the influence of the ridge and cool in the east with the trough. Why do ridges and troughs influence weather? Because ridges have sinking air, which kills clouds and air warms as it sinks. Also, the southwesterly flow on the west side of ridges brings up warm air from the south. Troughs have rising motion, which cools the air and causes clouds and precipitation, and the northwesterly flow on the west side of troughs bring cooler air from the north. Here in the Northwest we have gone between dry, warm periods and wet, warm periods. And it all has to do with the position of the persistent western ridge. Look at this schematic based on the upper level map I showed earlier. Nice ridge along the west coast. The arrows indicate the flow direction at this level and note the winds are parallel to the lines. West of the ridge axis there is moist southwesterly flow. If the ridge shifts a bit to the east or if its amplitude weakens a bit, the Northwest gets into the moist southwesterly flow--putting us into a wet, atmospheric river situation. Stronger ridge or positioned as shown below, we are warm and dry. California, located farther south, is far less likely to be hit by the moist, southwesterly flow and thus they are in a big drought. You can see this effect on the precipitation at Seattle-Tacoma Airport the past 4 weeks (see below). Long period of no rain (big ridge) interrupted by shorter period of intense rain (atmospheric rivers on the western side of the ridge). The blue line is the average situation. Could this contrasting pattern be caused by global warming? Averaged over the U.S., the temperature departures from normal are about zero (warmer west, cooler east). There is no uniform warming going on--so it doesn't appear to be associated with a large scale global warming signal. Folks on the East Coast might be complaining about global cooling with record-breaking snow hitting the Northeast, particularly around Boston. Some investigators have claimed this pattern of enhanced ridging in the west and stronger troughing in east is the result of global warming, but such causality is very unlikely. First, the papers claiming such a connection have been pretty much disproven, with serious faults in their methodology being shown. (Many of these papers were cited in newspapers and by politicians last year when the polar vortex was in vogue). Second, their is no long-term trend in such wave patterns, which one would expect if global warming was the culprit. Third, global warming simulations of the future climate under global warming do not indicate higher amplitudes of atmospheric waves. There are other reasons, but you get the picture. It is unlikely that global warming caused by increases in CO2 are causing this pattern. But what is the origin of this bizarre pattern of ridging in the west and troughing in the east? I will take that up in the next blog! Interested in attending the big local weather workshop of the region? The Pacific Northwest Weather Workshop will be held in Seattle at the NOAA facility on February 27-28th. Everyone is invited and the majority of talks are accessible to laypeople. To attend you have to register or they won't let you in the gate. There will be a major session on the Oso landslide. There is a registration fee that covers refreshments and food, and special student pricing. If interested, check out this website. I will be giving a provocative talk on this subject on March 11th at 7:30 PM Kane Hall on the UW campus in Seattle. Sponsored by local public radio station KPLU, tickets for this event can be secured at this web site. Cliff, awesome explanation. In Part 2, can you talk about the link between the constant ridge, El Niño, and pacific water temps? Seems like we were predicting this warm and wet winter over the summer and the talk was of el nino and water temperatures, not ridging. Do the water temps drive the ridge pattern? Definitely good read. Waiting for part 2. Chris&Sara, one thing to consider is that NWS/NOAA have been predicting mild El Nino's the last few years and did not get those right. Just because they called it and it occurred this year does not mean the earlier predications are casual. They had similar indicators in at least the two prior years and we did not have El Nino's. Thanks for standing up for science Cliff! The unscientific proclamations being made in the media and by some politicians drive me crazy. It's nice having someone with credibility speaking out against the distortions. The media had a field day with the now retracted warmest year ever surface temperatures. The attribution to human emissions is false because we know that it's mostly due to the borderline El Nino conditions we have had since June combined with the persistent ridging in the N. Pacific which has allowed enough warm water to pool there to change the PDO from cold to warm. I'm looking forward to your take on that in part 2! Did the Blob have any affect on the ridging? "Did the Blob have any affect on the ridging?" I think the blob did enhance the ridge but it's somewhat of a chicken and egg question. I'm hoping Cliff will give some insight as to what drives what. My feeling is that the ridge caused the blob but what caused the ridge?? I've heard about the MJO causing warm wet weather; is that a factor? "Some investigators have claimed this pattern of enhanced ridging in the west and stronger troughing in east is the result of global warming"
Cliff, could you site these papers? It's interesting that Cliff will engage people who post in the Times, but not on his own post. I would ask him, could this be a symptom of human induced climate change? I know he doesn't like the term Global Warming. Is the fact that San Francisco received no measurable precipitation this January, the first time in 156 years, possibly related to human induced climate change? Just curious. Perhaps the readership isn't enough to garner his attention. ryamkajr- The two previous years were forecast to be ENSO Nuetral years, they weren't forecast to be El Nino years as you are claiming. I don't understand your remark...I allow all comments that are respectful and don't call folks names. To answer your comment. I have no problem with the term global warming...use it all the time myself. And I don't think the current West Coast situation is indicative of global warming and the east coast cold wave is not a sign of global cooling. More in a future blog. Thanks Cliff. I love your posts and can't wait for part 2 of this one! I too am curious about the relationship between the warm blob and the ridge. I'm a salmon fisherman and the warm blob was definitely a factor in last summer's salmon runs (sockeye in particular). I'm also curious to know...if the ridge is unlikely to be caused by global warming, does the same hold true for the warm blob? How far south is the ocean warming / west coast ridging effect felt? Dr Mass, I really enjoy your blog - particularly the ones like this and and the white dust investigation are very enjoyable. I also find that your coverage of the big weather events with comparative forecast models and projected conditions to be extremely helpful as I bus commute from downtown Seattle to my home in the hills above Snoqualmie - knowing if it will rain, snow or blow fiercely at least gives me some forewarning to dress appropriately for the roughly 1/2 mile walk home from the bus stop. Thanks for your work here, I only sometimes wish you would post more often. could you please expand on your allusions to the jet Amplification theory being debunked? It seem quite apparent that that amplification is still quite apparent and resistant to change. Is the theory of latitudinal temperature gradient wrong or is there something else driving it? And please tell us where "the blob" came from. Cubic miles if water don't warm just because they think it's a good idea and the time has come.
" My confidence in this forecast is strengthened by the fact that is probably the result of a relatively slowly changing atmospheric circulation variation that is connected with slowly varying sea surface temperatures in the Pacific (more on that in a future blog)." Now you're saying that it's not a long-term (aka climate change) pattern? Also, given warming Pacific Ocean temperatures, shouldn't we expect a long-term ridge over the Pacific? I do enjoy your blog, and you've got an influencial voice in talking about weather in the NW, and seem to want to craft a voice about long-term climate. I went back and read the entries that came up with a search for "polar vortex" because I, like Elizabeth am interested in the papers tying a warming of the arctic with a disruption in jet-stream patterning. Your January 13, 2014 entry took on the issue, was very dismissive as those tying a disrupted gulf stream to climate change as unscientific and discrediting the science of climate change through their work. Theoretically, the connection makes sense to me as much of the jet streams energy is derived from the temperature difference between the equator and the poles. With climate change the poles have warmed quicker than the equator (In many cases quite dramatically). Therefore the difference in temperature between pole and equator is less now; the resulting jet stream slows, and like a river as it slows becomes wavier. This is my laymans understanding of the science. This science is being printed in peer-reviewed journals. The most recent and well-regarded paper is here, published Jan 2015 in "Environmental Research Letters" , : http://iopscience.iop.org/1748-9326/10/1/014005/article. I'm concerned you are being overly dismissive of this theory, which is gaining credibility, before all the information and research is in. I think it is a difficult position to argue our current weather pattern isn't heavily influenced by SST anomalies.. And it's a really tough case to explain away SST anomalies from climate change. It's a bit like saying, well jumping off a bridge won't kill you, it's the sudden stop at the end. On another note, last Sunday prior to the wind storm I saw lightning track up the valley in Oregon around 8pm. In FEB!! Also, The workshop in Seattle 2 weeks from now, are the events occurring on Friday and Saturday different or would one just need to attend one day to get the full experience of the workshop? thanks. I'll look forward to it. Fair to say then that the amplification is annomolous? Is there history of such in the past? Normally, the high in the north pacific breaks down in the winter. Is this due to cooler temperatures? Is the high not breaking down because of warmer temperatures? The weather may look within normal variability in Seattle, but in CA we don't think so. Is it climate chaos? Whatever Happened to El Nino?